Yes it's true - I'm a Shanalogic.com addict. I can't help it, they've got too much cute stuff! Way back in December I posted about a happy shopper competition that Shana was running over on her facebook page. Turns out I ended up winning that competition so I had a $50 voucher to spend at her lovely shop. It was such a hard decision on what I wanted to buy with that voucher but I've had my eye on the Raccoon Love Ring by Mark Poulin for a while and I figured there was no better time to treat myself. 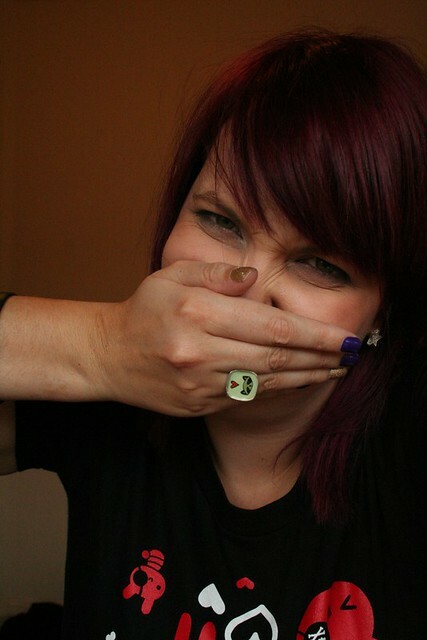 Yesterday it arrived in the mail and I am BEYOND excited with the ring (as my facial expression will show). It's SOOOOOO beautiful and amazing and sweet and all those nice words you could ever think of. It fits perfectly (which is always the concern when buying rings online) and that sweet little raccoon face will be looking up at me pretty much every day. The band is a good solid band without being chunky and it's really comforable (I've been wearing it all day and only noticed I had a ring on when I looked at the cute face). This ring will not be seen off my hand for a long time to come. Shana also included a nice little gift in my parcel which was completely unexpected but absolutely lovely. 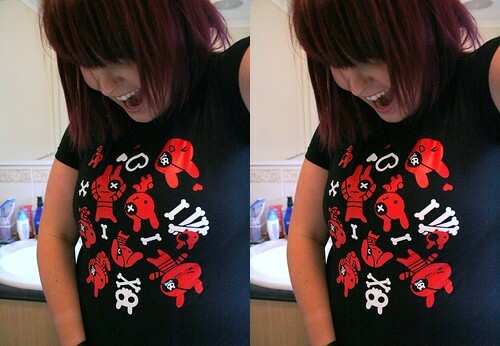 She included the Pirate Bunnies Tee by Claire Belton. I don't know about anyone else but the combination of Pirates and Bunnies is far too cute to pass up. I love it to pieces and will be wearing it a lot!!! My older sister also bought 2 x prints from the Fine Art section (the Luau LuLu Print by Tsai Fi and the Pandasm Print by Cuddly Rigor Mortis) for her 2 kids rooms. I have literally just spoken to her on the phone and she is so excited about them. She went out and bought frames and is stoked with how they look in the two kids rooms. I seriously love love love this shop and Shana is AMAZING! I shop online because there is so much cute things on the internet that I can't get in the shops at home. I shop at Shanalogic.com the most because everything I buy from there I love and it feels good to support Indie artists and Shana. Plus their service is brilliant and the shipping is extremely fast (usually gets to my house about a week after ordering). I'm the first person to rave about how great they are whenever I get a compliment for anything that I buy from the shop. I already have my next order planned out (it will include some Sugarpill make up). Thank you Shana and your amazing team for always being lovely and for making your customers feel extra special with your cute notes and special gifts! You guys are the BEST! Shop Indie, Pass it on! YAY!!!! You know I love you girl!